Renowned studio trumpet player Tony Terran, the last surviving member of the I Love Lucy show orchestra, died in Los Angeles at age 90. 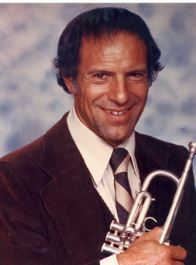 As a session musician Terran was regarded as one of the most versatile trumpet players in the music business, and had an impact on the Los Angeles music scene for more than four decades as a specialist of many musical styles. He was part of the Wrecking Crew, which was a group of session musicians in Los Angeles that earned wide acclaim in the 1960s. The Wrecking Crew was inducted into the Musicians Hall of Fame on November 26, 2007. Terran was born in Buffalo, New York, where he worked on live radio shows in high school. In 1944, he arrived in Los Angeles after touring with Horace Heidt. In 1945 he began working with Bob Hope, and then with Desi Arnaz in 1946. His relationship with Arnaz involved him with the beginnings of Cuban/Latin music in the United States. Terran had the distinction of playing on the first filmed television sitcom (I Love Lucy), and playing with some of the first R&B bands to use horns in the early 1950s. Terran performed and recorded with many notable artists including Frank Sinatra, Nat King Cole, Ella Fitzgerald, Perry Como, Linda Ronstadt, Peggy Lee, Benny Goodman, Elvis Presley, Madonna, Diana Ross, Ray Charles, Michael Jackson, Bob Hope, Barbra Streisand, Chicago, the Beatles, the Beach Boys, the Bee Gees and the Tijuana Brass. Terran played on many recordings of television shows including I Love Lucy, The Lucy-Desi Comedy Hour, The Lucy Show, Here’s Lucy, The Brady Bunch, I Dream of Jeanie, Happy Days, Popeye, The Carol Burnett Show, Cheers, L.A. Law, The Simpson’s and Star Trek. He also played on many recordings of film soundtracks including Rocky I, II and III, Karate Kid I, II and III, The Natural, All The Presidents Men, Broadcast News, Field of Dreams, Grease, Officer and a Gentleman, Ghostbusters, Close Encounters of the Third Kind and The Deep. Terran was also a featured soloist for distinguished composers and arrangers including John Williams, Patrick Williams, Lalo Schifrin, Elmer Bernstein, Jerry Goldsmith, Henry Mancini, John Barry and Nelson Riddle. Terran received the Most Valuable Player Award from the National Academy of Recording Arts and Sciences in 1974. Terran is survived by his sister, Rita Terran Harper, his children, Mark Terran, Dave Terran, Eve Terran, Jennifer Terran, and his step-daughter, Aprile Boettcher. This entry was posted in All News, Final Notes / In Memoriam and tagged I Love Lucy, I Love Lucy orchestra, Tony Terran on March 22, 2017 by admin.